Perhaps no dog is as recognizable as the Corgi. These short, long dogs are a magnet for social media attention, well-known even by those who have never seen one in person. They are well loved around the world – particularly by a certain British Queen. But, recently, there’s been some talk about teacup Corgis. While normal sized Corgis are not very large, they are not appropriate for smaller apartments or homes. For this reason, some wonder whether or not it is possible to get a smaller version of these adorable dogs. 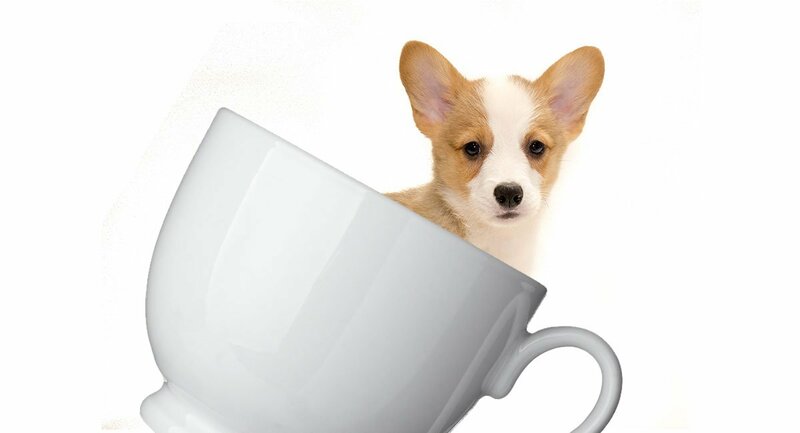 In this article, we’ll discuss everything you might need to know about a teacup Corgi. We will explore how they are created, the differences between teacup Corgis and normal-sized Corgis, and whether this small dog is right for you. There are countless reasons why a potential dog owner might want a teacup version of a Corgi. Firstly, teacup Corgis fit better in smaller spaces than a normal-sized Corgi. Smaller dogs take up less room. Every little bit counts when you live in a small apartment or home. Smaller dogs also require smaller equipment. You don’t need a large dog bed for a tiny dog. If you live in a smaller space, this can be extremely valuable. Secondly, smaller dogs typically require less exercise than larger dogs. This isn’t necessarily because smaller dogs enjoy laying around more. But smaller dogs definitely take more steps and exert more energy when they run and play. It takes less distance to tire a smaller dog on a walk than a bigger dog. If you don’t have much time, this lower exercise need can be important. Thirdly, many people just think smaller dogs are cuter. Smaller dogs often look like puppies for longer and make better lap dogs than bigger dogs. Lastly, smaller dogs are also easier to transport than larger dogs. If you want to travel with your pooch, smaller dogs are easier to accommodate in cars and hotel rooms. Many hotels have weight limits on the dogs they allow. This can make traveling with a larger dog somewhat more complicated. Where Do Teacup Corgis Come From? There are three ways to make a teacup version of a dog. Each comes with its own drawbacks and difficulties. The easiest and most common way is to mix the breed with a smaller dog. Since mixed puppies get traits from both parents, this commonly results in smaller puppies. Another way is to introduce the gene for dwarfism. While this works for many dog breeds, it is more complicated with the Corgi, which we will discuss later. Lastly, some breeders also attempt to breed runts repeatedly. Puppies get their size from their parents. So, if you breed smaller dogs together, it only makes sense that you will get smaller puppies. We will discuss each method, in turn, to give you a complete understanding of the process. A common, easy way to create a teacup version of the Corgi is to breed it with a smaller breed. Mixed breed puppies inherit traits from both their parents. So, if you breed a Corgi with a smaller dog, there is a chance that the puppies will be smaller as well. However, the puppies can inherit ANY trait from either parent. It is likely that the puppies will not look or act exactly like a Corgi. In fact, they could not look like a Corgi at all. While this method is very easy and can create smaller puppies, these puppies will likely be very different from normal-sized Corgis. But mixed breeds are actually very healthy under normal circumstances. This makes this method one of the best for creating miniature dogs. Let’s look at some of the most common mixed breeds that can result in smaller puppies that resemble Corgis. Chihuahuas are some of the smallest dogs in the world. When you combine a Chihuahua with a larger dog, it will likely result in smaller puppies. This makes the Chihuahua popular among breeders who are trying to make teacup versions of dogs. The teacup Corgi is no different. Of course, the Corgi Chihuahua mix is not going to look or act exactly like a Corgi. Their appearance will vary a lot from puppy to puppy depending on what traits they inherit from which parent. These mixed breed dogs will likely not be as friendly as a Corgi. They will also not do well in homes with other pets or children. Chihuahuas are also known to be somewhat aggressive towards other humans and people. So, early socialization is a must for this crossbreed. Dachshunds are also smaller than many other dogs, making them popular for smaller crossbreeds. Both the Corgi and Dachshund have smaller than average legs and a long body. Combining them will result in puppies with similar features, which will make them look more like a Corgi. However, these longer, shorter canines are also prone to many back problems. Their legs just aren’t designed to support their back properly. IVDD is extremely common in these dogs. It is essential to ensure that these dogs regularly exercise and eat a healthy diet. Weight must be managed to ensure that extra pounds don’t put a strain on their back. They should not jump or use stairs often. A straightforward way to create a miniature version of a dog is to introduce the dwarfism gene. But this is a lot more complicated than it sounds. It is not possible to simply breed a dog with the dwarfism gene. Instead, the gene must be the result of a random mutation or introduced through mixed breeding. Some dogs are more prone to this mutation than others. Some breeds actually don’t exhibit the mutation at all. However, matters are particularly complicated by the Corgi, who already has a form of dwarfism called achondroplastic dwarfism. This form of dwarfism prevents the turning of cartilage into bone during fetal development, which results in shorter than average limbs. This is why the Corgi’s limbs are so short and stubby. While this is what makes the Corgi so recognizable and cute, it also causes them health problems. Their short legs just aren’t designed to support their long back, which causes back problems like IVDD. Breeding runts together is another way breeders attempt to create teacup Corgis. Runts are puppies that are smaller than average. It makes sense that breeding these puppies would result in even smaller puppies. However, these small dogs are often small for a reason. They commonly have underlying health problems and developmental delays that have made them small in the first place. For example, health defects are not uncommon in runt-sized puppies. Breeding two runts together can cause their puppies to inherit these disorders and health problems. This causes the puppies to be unhealthy and sickly. Is a Teacup Corgi Right for Me? A teacup Corgi can make a healthy pet as long as you are careful picking out your puppy. We recommend picking a puppy that is the result of a mixed breed, not the product of runts. While these mixed dogs will not look or act exactly like a Corgi, they are the healthier option. Furthermore, we recommend adopting a puppy that has a proportionally sized back and legs. This will prevent the puppy from developing back problems in the future. These dogs will do best in homes without small children. Small children can easily mishandle these tiny dogs, resulting in back problems and IVDD. It is also best if your home is designed to be maneuvered by a smaller than average dog. This means fewer stairs and spaces that require little jumping. This will not only allow your dog to move around the home freely but also prevent back strain. We recommend beginning your search by looking for Corgi mixes that result in smaller dogs. We particularly suggest looking for a Chihuahua Corgi, as these dogs are less prone to health problems than some other crossbreeds. It can be difficult to locate a mixed breed breeder. But mixed breeds are becoming more popular. So it is not impossible. Stay away from puppy mills and pet stores, as these places often do not follow ethical breeding practices. You might also want to consider adopting a dog from a shelter or rescue. Adopting an adult dog from a shelter is particularly advisable if you are concerned about their size. With puppies, all you can do is guess how big they will be when full grown. By adopting an adult, you can be certain of their adult size. If at all possible, you should check on a puppy’s parents and grandparents. This will give you an idea of how big the dog will grow as well as inform you about potential health problems. Brisson, Brigitte. “Intervertebral Disc Disease in Dogs.” Veterinary Clinics: Small Animal Practice. 2010. “Achondroplasia.” U.S. National Library of Medicine. Breit. “Osteological features in pure-bred dogs predisposing to thoracic or lumbar spinal cord compression.” Research in Veterinary Science. 2002. Fox. “The Pathophysiology of Neonatal Mortality in the Dog.” Journal of Small Animal Practice. 1965.